This first quilt was made using a center donated by Kate bordered with some vintage Irish linen from my grandmother's stash. I love string blocks, and maybe someday I'll actually make some of my own - but I sure appreciate the ones that are donated to us!! This one went to a lady in New Orleans who is dealing with multiple cancers. She loves blue and I think this just fits the bill!! This beautiful top was given to us by Annie, who saw it for sale on someone's blog and had it sent to us for the ministry. Isn't it beautiful - very manly, all homespuns. It now belongs to a man with lymphoma in New Orleans. The center of this adorable I-Spy quilt was pieced by Margaret, and I added borders to make it large enough for its recipient, a six-year old boy who is having heart valve replacement surgery this week. Aren't these I-Spy blocks great? I believe they came from Diane, and there was even one with french fries and another with pickles! So cute!! This last quilt is my favorite for the week (probably because I got to make it from start to finish!) It's a postage stamp quilt made with all batiks. We received a donation of a wide variety of batik fabrics, so I think I used twenty-one different pieces. This was a joy to make, and now I want to make lots more!!! It was given to a woman in our church who was just diagnosed with breast cancer. This was totally unexpected for her, as there is no family history, and it was important to me to get a quilt to her quickly so she would have that constant reminder that many people are praying for her. I hope it makes her smile every time she sees it! So those are the quilts we've given out this week. I'm currently got seven more quilts ready to go on the frame - there should be a big update next week!! Thanks again for all your support - we couldn't do it without you!! All those quilts look fabulous Sarah! Well done to the creators!! I'm sure they will be/were all loved and appreciated by their recipients!! Awesome quilts!!!! Ya'll are doing great and just keep growing. They are all so beautiful! I don't know how you get so many done. What a blessing and inspiration your quilt ministry is to so many people. I'm especially inspired by the "I Spy" quilt. I usually make quilts for children so I have a huge selection of leftover "kid friendly prints" that aren't big enough to do much with on their own, but I hadn't really thought to combine so many different ones into a single quilt. 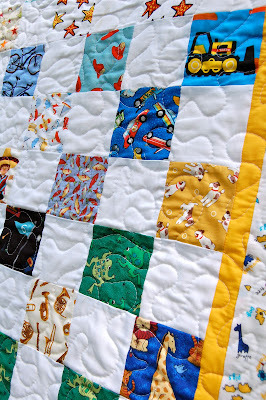 This is the perfect way to use up some of those prints and make a really fun, cheerful quilt for a child. I can see doing it with 2 or 3 of the same print squares, too, to make a fun "find the match" game right on the quilt. 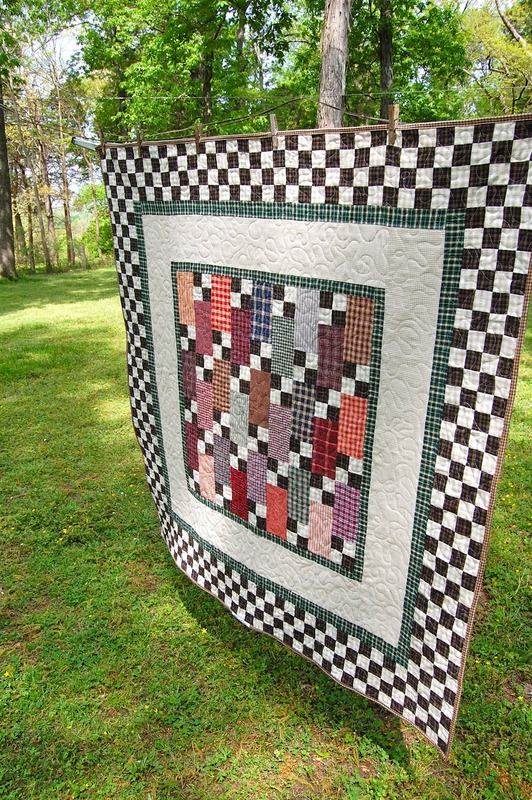 Nice job with the batik postage stamp quilt - how big are your squares? 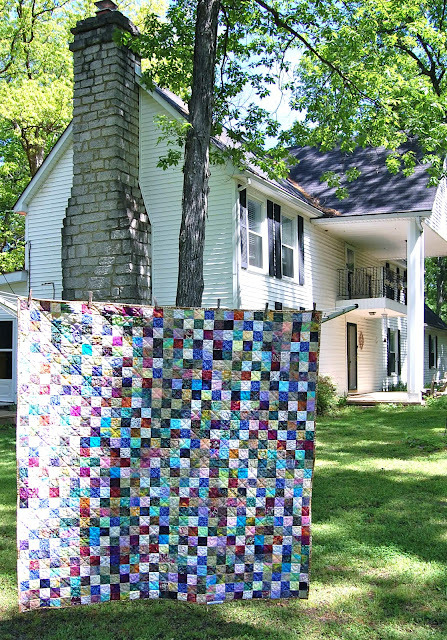 I never get tired of looking at string quilts, myself. They're always so beautiful! I love the Batik Postage Stamp Quilt. I think I must make one like it. I love Batiks I have never bought one but have received them in things ive been given and was looking for a great project to use them in and that is just the project for it. These quilts look beautiful! Such great work! I'm praying for those receiving them. I'm so glad they have a quilt to remind them they are remembered. Love these charity quilt. The one that is a Quiltville pattern looks amazing with the checkerboard border. Oh. My. I DO like that batik postage stamp quilt! Batiks are so fun to sew, aren't they? All this ministry quilts are great. Love what you're doing. that batik postage stamp quilt is stunning! wow!!! The batik postage stamp is beautiful...just don't know if I have the patience to make it!! LOL! SO I will admire yours!!! Make-A-List Monday - Thankful for Progress! Hands2Help - Featuring Guest Blogger Miki Willa! Hands2Help - Time to Check In! !